Aren't these spectacular? Can you believe that they were made by fourth graders? A-ma-zing. And, as a bonus, there is a math tie in and, as one of my smart followers pointed out, Social Studies! 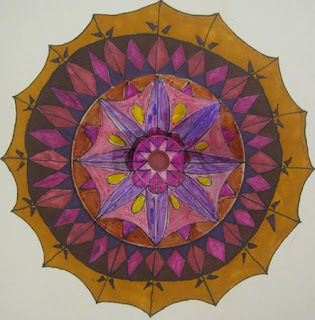 Step 1: Discuss Mandalas and show examples. 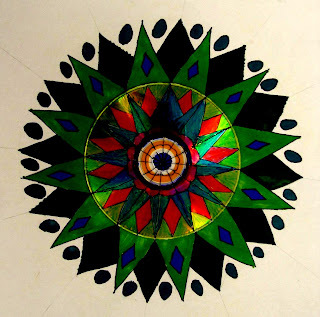 Some great resources are Mandalas of the World, Mandala coloring book, and The Mandala Project online. Step 2: Using pencil, trace around the two lids to make concentric circles- these will be used as guidelines and may be erased later. Step 3: Hot glue an old CD (blank side up) in the center of the circles, making sure it is centered. Step 4: Using the fine tip permanent marker, draw a dot in the center of the CD.Line a ruler up with the dor and draw a line across the CD. 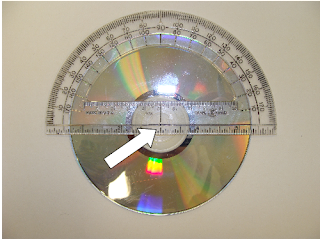 Step 5: Find the hole at the bottom of the protractor (shown by the arrow in the 1st photo below) and line it up with the dot in the center of the CD. 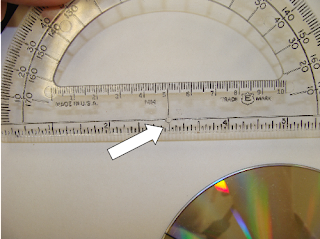 Make sure that the black lines on the protractor's bottom line up with the black line that has been drawn across the CD (shown in 2nd photo). Step 6: Keep the protrator in this position and make a mark at every 30 degrees (30, 60, 90, 120, 150, 180). Flip the board around and repeat steps 5 and 6 so that the CD is marked every 30 degrees all the way around, as shown in the 2nd photo below. Step 8: Continue connecting the marks all the way around to make 12 equal 30 degree sections. *Note: be sure to remind students that when they line up the two marks, they also should line the ruler up with the center dot. I have had students connect the wrong marks! If a mistake occurs, whiteboard cleaner on a kleenex will remove the permanent marker. Step 9: For this step, use the fine line permanent black marker. Focusing on one wedge, draw a simple design using lines and shapes. Use the center circles to help space out your design. Step 10: Repeat this same design in the remaining sections. 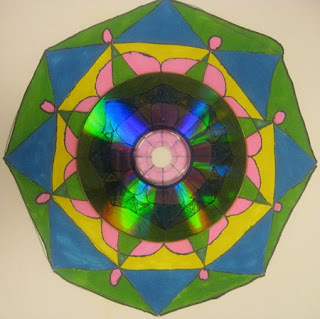 Remind students that the design uses Radial Symmetry (math term! ), meaning that it is the same all the way around. Again, use the circles as a guide to line up the design. Step 11: Using the ruler and PENCIL, lightly extend the sections out on to the board, past the edges of the previously drawn circles. Remember, these are guidelines and may not be kept, depending upon the design. Step 12: Using the previously drawn lines as guides, draw another design in one of the sections. I have the students use pencil at this point. Step 13: Once the design is decided upon, trace the lines to be kept with the fine line permanent marker. 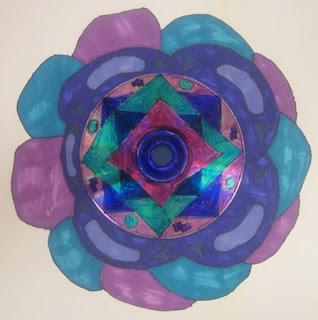 Step 15: Have students choose 5 or 6 colors to use in their design. Explain that dark colors should not be placed next to other dark colors. *Note: Have the students make a mark using each color on the BACK of their board so that they may match them up during the next week. 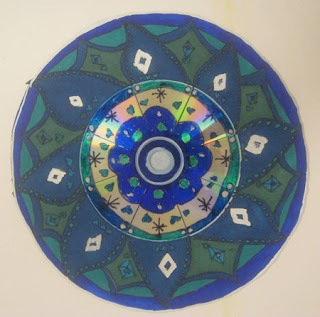 *Note: Colors will show up lighter on the CD than on the board. 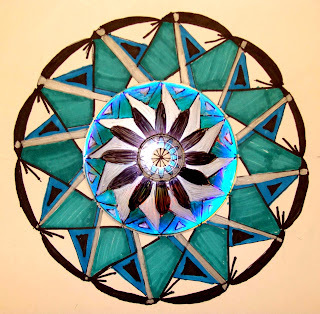 View our gallery of Mandalas on Artsonia. WOW! I'm emailing the teachers at my school for their old CD's right now! This is So cool! This might tie in nicely with a social studies/diversity lesson as well. Maybe we'll try it with our Kids for Peace group! Thanks Mrs. P! 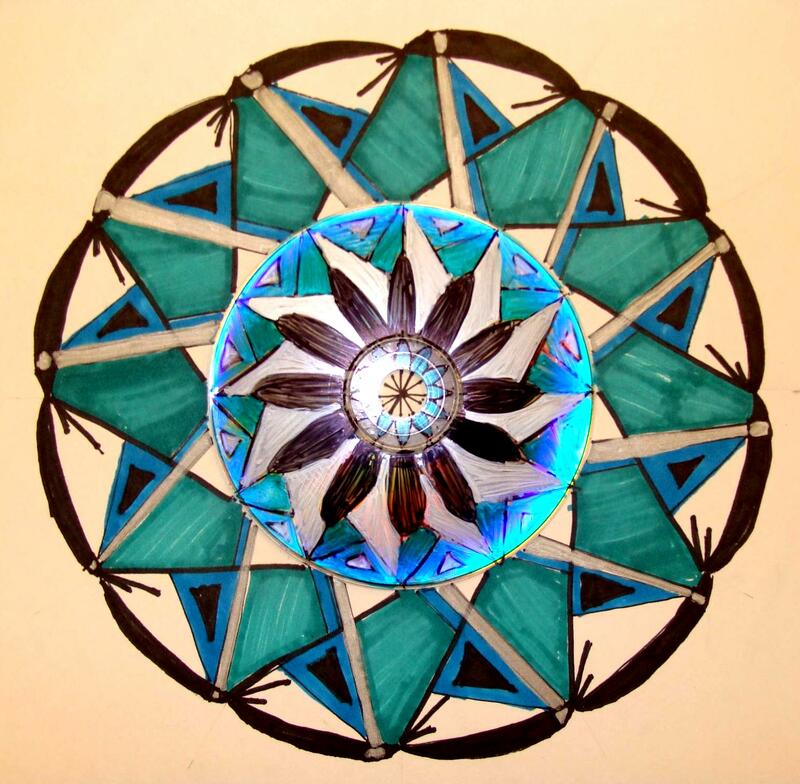 I love what the CD adds to the mandala!! I love, love, love this idea! I'm going to do this with my high schoolers!!! Fabulous! I hve old cd's set aside for my 2nd graders, but this would be too hard for them. Maybe I can simplify it. In the meantime - I emailed you to ask for your mailing address so that I can send you your Keith Haring book, but you didn't answer and I wondered if perhaps the email went into your spam-box. Anyhow, I'd like to get it in the mail tomorrow, since I won't be home Wed thru Fri. So please when you read this, email me at plbrown3@yahoo.com with your maiing address. Me again... just home from NYC and would like to mail your book. So a dumb question: is your name REALLY Mrs. Picasso? (If so, how cool for an art teacher!!) However, if it's not, I really need a name to put with the street address in order to mail the book. Probably I should also have the name of the school along with the street address you gave me - I want to make sure it actually gets to you! If you don't want to put this info in a post or comment, that's why I gave you my email address. Once I mail the package I can delete the email. Sorry, Phyl! 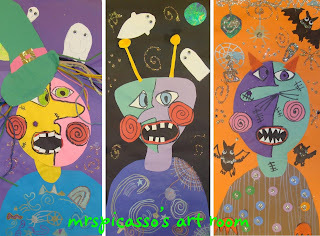 My name is NOT Mrs. Picasso, though that WOULD be awesome. LOL. My name is Denise Pannell. The kids call me Mrs. P.
Wow! What a great idea! I bet the kids enjoyed making them and seeing how different each one turned out. Fourth graders..Wow I'm impressed! This is a wonderful idea! Lovely! Love this! What size did you cut the poster board? Did the kids duplicate their designs free hand? We use the white side. Yes, the kids draw freehand. You can add more rings, drawn lightly in pencil, to use as guidelines. Erase after they are finished. What a fabulous idea! The kids did a wonderful job.